Increased Traffic - As more and more people read your bookmarked blog post/ web article and vote for it, the more popular it becomes & the traffic to your site increases. Increased Visibility & Branding - Submitting to Social Bookmarking Sites puts your blog/website out there in front of millions of people, increasing your visibility ten notches and getting you more branding. Get more Links - Each of these Popular Social Bookmarking Sites see tremendous volumes of traffic on a daily basis, if your blog/website has good content on it, chances are that several of these users will link to your content, thus getting you relevant links which will ultimately lead to an increase in your Rankings in the Search Engines. Save your Precious Time - Social Bookmarking can really be a time-consuming process with you being required to create an account in each site before submitting your page to them manually. We have made things easy for you, just sign up, enter the page you wish to submit and we do the rest for you, saving you plenty of time in the process. Simple 1 minute process, all you need to do after signing up is login to your account and enter the url of the webpage you wish to submit, our system then automatically fetches the required data from the said page (or you could enter the information yourself) and you just need to choose your submission options and make a payment. It’s that simple! Live Reports to help you track what exactly is being done. The report includes the links to the exact page on the site where you can find your listing. Tremendous value for money, at 19 cents a submission combined with our rewards program, we not only are the cheapest in the business, we also offer you tremendous value for your money. 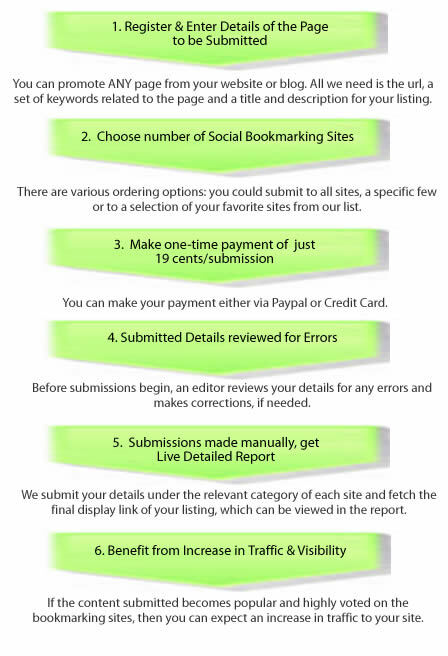 Given below is the list of social bookmarking sites that we submit to. This list is regularly updated. At present, there are 422 sites on this list.